Photos and writing by Samantha Wilson, created during the Fall 2017 semester. 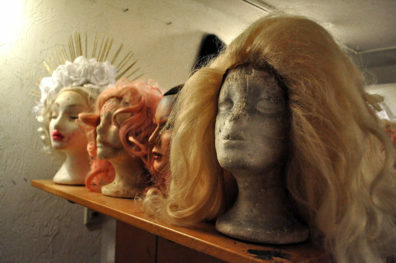 On any given night, the drag queens will arrive three or more hours before the show to get ready. Most of this is due to the amount of makeup they need to wear to make sure it can be seen under the harsh stage lights. However, it also takes time for them to put on their hip padding and tights too. For example, Sugar Woodward wears a minimum of 4 layers of tights to soften the look of the padding (which is made out of green foam). A row of wigs line a shelf in the dressing room at Club Out And About in Pasco, Washington. 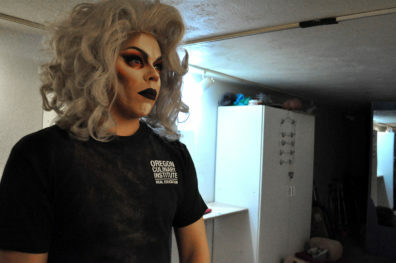 Drag Queen Tatiana Rexia carefully creates a winged look with her eyeliner before the show. 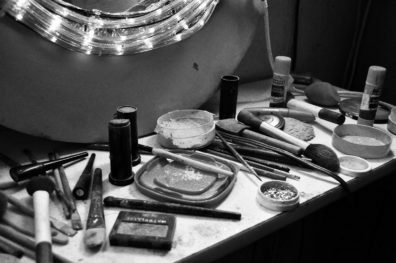 Drag Queen Sugar Woodward’s make-up station. Elmer’s glue sticks are used for covering up eyebrows so drag queens can draw on different ones. Drag Queen Hannah Rexia fills in her eyebrow before the show. Her partner stands behind her in support. The queens take regular smoke breaks together before the show. “It helps calm my nerves,” says Tatiana. Tatiana and her friend visiting from Seattle, Drag Queen Victoria St. James, finalize the song list before the show. Victoria St. James reminds Tatiana that there’s only five minutes before the show. Tatiana makes a final wig decision before changing into her outfit and heading upstairs for the show. Tatiana performs to “New Rules” by Dua Lipa. Hannah Rexia goes down into a full side splits as the crowd tips her. 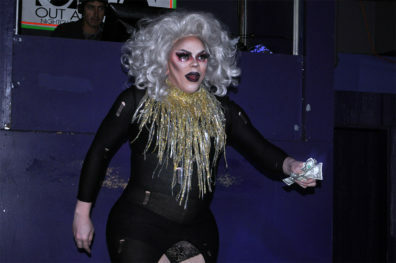 Hannah steals a look at the camera for a moment while collecting tips during her performance. Tatiana lip syncs out to the audience during her last performance of the evening.